Photo courtesy of John Penvenne, Penscil, Inc.
NovaLynx is an industry leader in the design, manufacture, and integration of meteorological systems. Using the best possible combination of meteorological sensors, signal conditioning, and data acquisition technologies, we can build a custom weather station to meet your exact requirements. We specialize in rugged equipment, suitable for industrial applications, that provides the accuracy required by scientific researchers and weather professionals. We offer several popular weather station packages. The WS-25 Weather Station is a user-friendly station that provides professional quality at an economical price. Its modular design makes it ideal for a wide range of applications. 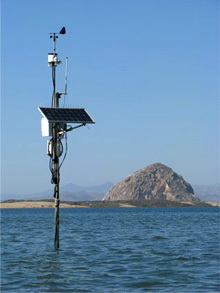 The WS-25P Portable Weather Station is a complete system housed in a weatherproof case, weighing about 20 pounds, and can be deployed in less than five minutes without the use of tools. Applications include hazmat/emergency management situations, fire management, and temporary meteorological surveys. The WS-32 Packaged Weather Stations are based on the powerful NL32 Data Logger and are configured with sensors selected to achieve the level of accuracy required for specific applications. We manufacture a complete line of high quality weather instruments including rain and snow gauges, anemometers and wind vanes, evaporation pans and gauges, and more. Our product data sheets are available online for easy reading and printing. Please let us know if you have any questions. We look forward to hearing from you!